The handsome Castle Cornet emerges into view as my ferry sails into St Peter Port, the capital of Guernsey, about 50km (30 miles) west of Normandy, France. Several passengers in the Ocean Plus section get up and gather at the front of the ship to take pictures. I’m reluctant to get out of my seat, in which I have cocooned myself for the last two hours, napping and dreaming about something as abstract as a Jackson Pollock painting. The beautiful Guernsey view, however, is a welcome reward. Taking the Condor ferry to Guernsey has proven to be a wise choice. I’m glad to be free from any airport security hassle, and I don’t have to worry about luggage restrictions and tiny airplane seats. Hooray! In fact, it only took me two-and-a-half hours to drive from Central London to Poole (a coastal town in Dorset, Southern England) before catching the ferry to Guernsey. My car is comfortably parked on one of the lower decks, and I’m now on the passenger deck, joining the crowd in taking pictures. St Peter Port bathes serenely in the afternoon sunshine. The cloudless sky is intensely blue and the sea air is most refreshing. Beautiful yachts dock at the marina. Beyond it, neat, pastel-coloured buildings stack up against the hill, their steeply pitched roofs occasionally punctuated by treetops swaying gently in the sea breeze. With such sensational views to start my holiday in Guernsey, I know I’m in for a good time. With 27 beaches on the island and everyone seems to have a favourite, choosing one to visit can be a hard choice. Vazon Bay, the island’s largest beach, reveals a blue sea so clear that it can rival any beach in the Caribbean. This is also an ideal place for windsurfing. Then there’s Petit Port, a stunning hidden cove at the foot of two towering cliffs where pale green waves lap the sandy shore. With a 100-metre descent (272 steps) from the coastal path and no facilities, this beach is favoured by young adults who don’t mind the steep walk to have a quiet beach to themselves. My personal favourite is Port Soif – a wide, horseshoe-shaped beach surrounded by sand dunes. It is much quieter than its lively neighbours Saline Bay and Cobo Bay, plus the swimming here is excellent when the tides are in. Many locals, however, like to take a dip by the boat ramp next to Fort Grey (Rocquaine Bay) on the west, as well as in Bordeaux Harbour on the opposite end of the island. Families with young children tend to prefer the calm Victorian bathing pools in La Vallette. There are three pools altogether, with the two next to the Aquarium more popular than the one closer to the main road (South Esplanade). 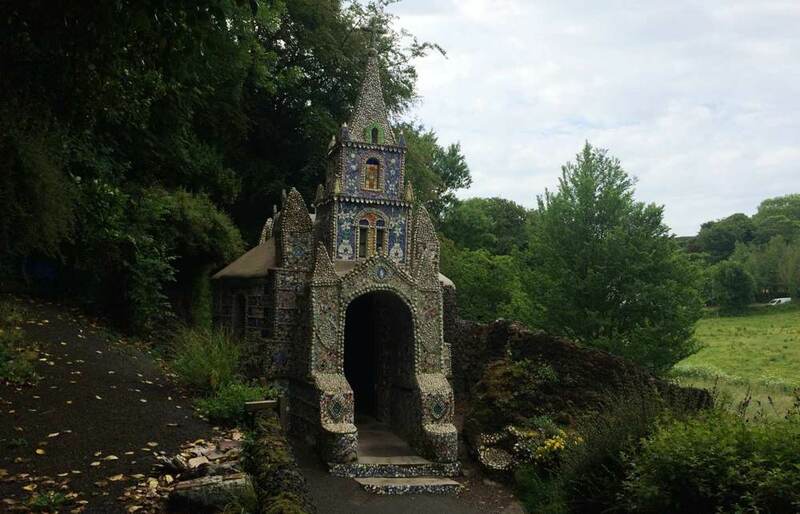 The tale of this quirky gem started in 1914 when Brother Deodat Antoine decided to build a grotto similar to Our Lady of Lourdes in Massabielle. 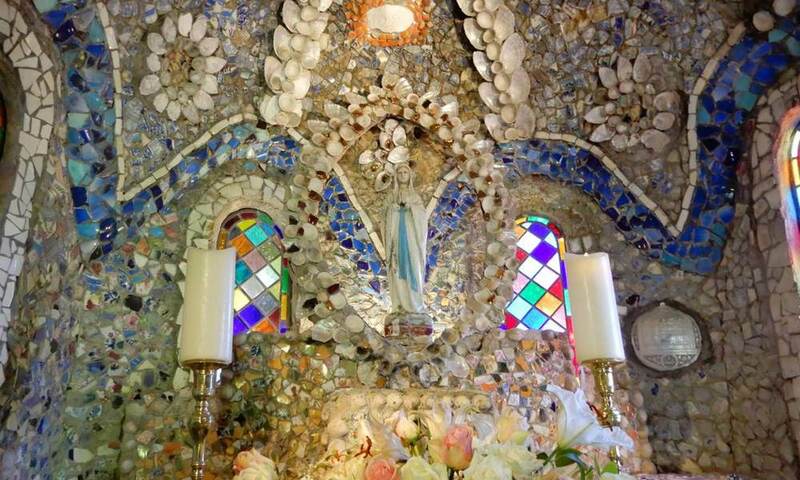 His first grotto was 9 feet by 4.5 feet, which he pulled down after it was criticised for being too small. He then set out to build a slightly larger grotto – this time 9 feet by 6 feet. Over the next two decades, he continued to expand the chapel and collect pebbles and colourful fragments of china to decorate the walls. Today, the main altar area is quite roomy in comparison to the previous versions – there is enough space to fit a priest and a congregation of five. In front of the altar on the right, take a small staircase to explore three smaller altars hidden below. After the last Ice Age ended about 11,500 years ago, the sea level rose and separated Guernsey from continental Europe. Neolithic farmers came and settled along the coast, and their dolmens (Neolithic tombs) are common on the island. 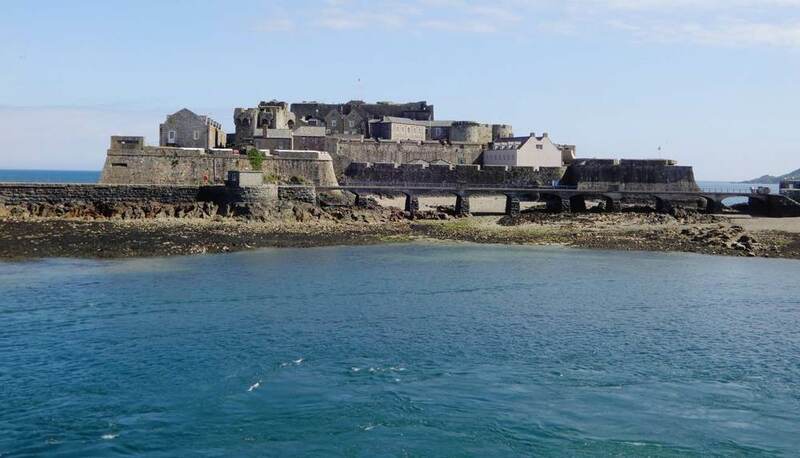 The best place to learn about island life from prehistoric to more recent times is the Castle Cornet, which proudly guards the harbour of St Peter Port. There are five museums within the compound, including the Story of Cornet Castle Museum and the Maritime Museum; they both give you an insightful glimpse of the island’s past. 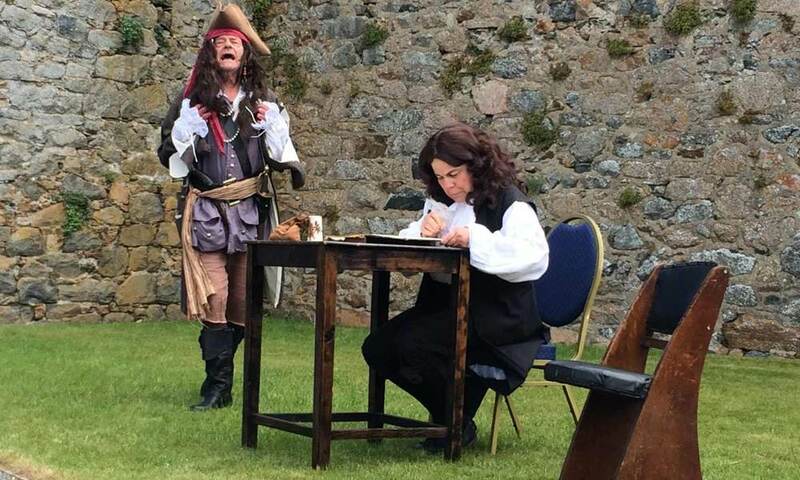 There is also a midday gun firing from March to November, and an outdoor theatre performance by the Guernsey History in Action Company from April to September. Also scattered around the island are four museums telling the dark tales of the German occupation, which lasted from 1940 to 1945. 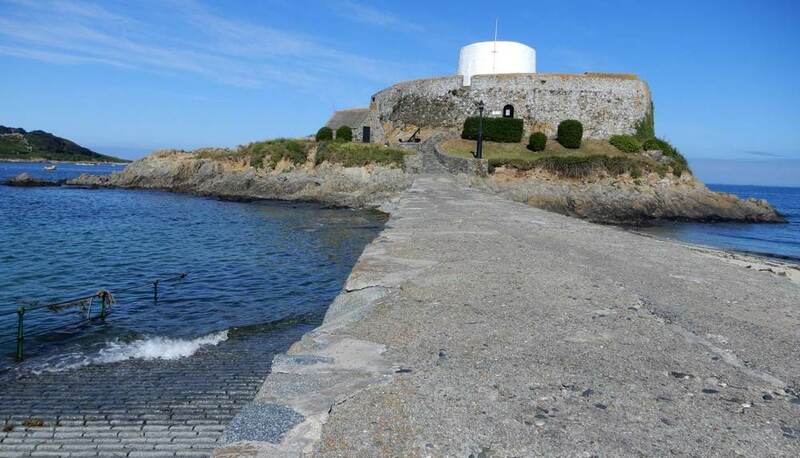 Guernsey, along with Jersey, was occupied by Germany during World War II, and during those horrific five years, some 13,000 German soldiers oversaw slave workers reinforce many bunkers and watchtowers around the island. After the liberation, the Germans left behind a sizeable amount of memorabilia which are now on display in these museums. Guernsey is a well-developed offshore financial centre. 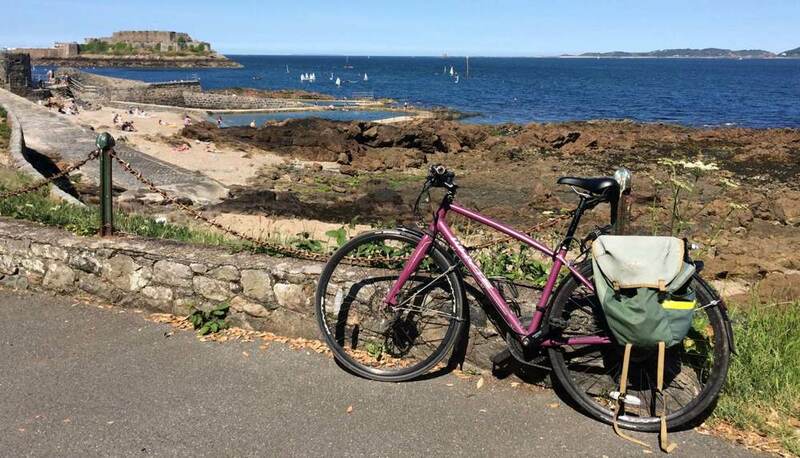 With international bankers living and working on the island and a large crowd of tourists fuelling a strong demand for great food, Guernsey is fast becoming a foodie’s paradise. The island’s secret is a wealth of fresh, local produce delivered by local fishermen, farmers and dairy producers directly to kitchens. 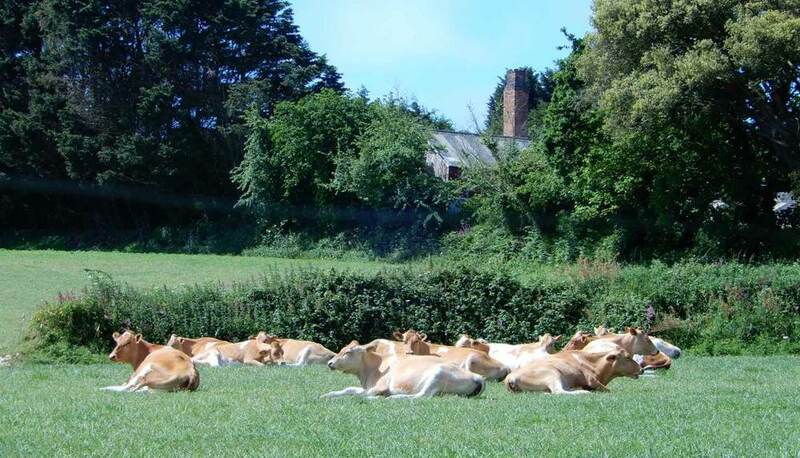 Guernsey is situated 50km (30 miles) west of Normandy, France and 130km (80 miles) south of England. It’s a self-governing British Crown dependency, meaning it is not part of the United Kingdom or the European Union. From Poole in the south of England, Condor Liberation departs for Guernsey before going on to Jersey. The catamaran can comfortably take 245 cars and 880 passengers – meaning that upon arrival, you can explore Guernsey in your own car. The ship’s three engines develop over 36,000 horsepower, the equivalent of 50 Formula 1 race cars, to ensure a smooth and speedy journey. Please see the Travel to Guernsey guide on information on air travel. Established in 1968, Condor (www.condorferries.co.uk) ran hydrofoils between the Channels Islands and France and almost two decades later, launched a catamaran passenger ferry. The company now runs regular freight and passenger ferries between the UK, Guernsey, Jersey and France. 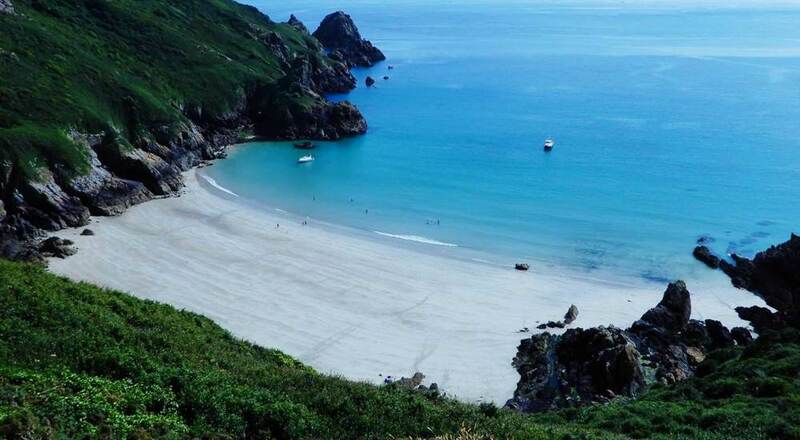 Guernsey has a large selection of hotels, bed and breakfast, camping sites and self-catering apartments to suit every taste and budget. 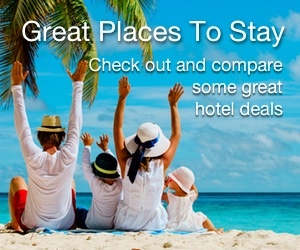 Keen hikers may want to select a hotel that is right by the coastal paths. The Peninsular Hotel (www.peninsulahotelguernsey.com), located near Rousse Tower on the north side with views over Grand Havre Bay, is a good choice.